Summary: A girl and her father walk through the city, meeting dogs of many different breeds, such as the Afghan hound: “Although he’s noble and aloof/He’s still a dog, so he still says ‘Woof!’” and the basset hound: “For things she can smell/She’s a comer and goer/She’s much like a Beagle/But longer and lower.” 38 dog breeds are covered in all, with each one getting a two- or four-line rhyme. 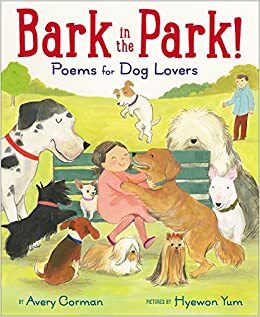 The book concludes, “So here’s to dogs both big and little/And the others in the middle/And here’s to all the mixed breeds, too/Being friends with a dog is a dream come true.” 48 pages; ages 3-7. Pros: Dog lovers are almost sure to find at least one of their favorites in these pages. The poems are short and sweet (written by the author of Kramer vs. Kramer and Oh, God!, oddly enough), and the unstintingly adorable illustrations make a perfect pairing. Cons: Some lines had an extra syllable or two that made them a little less than flowing.